I managed to catch “Drive” over the weekend and the movie was everything I expected it to be; and while many will feel that Ryan Gosling steals the show portraying the quiet smoldering stunt driver “Driver” in the movie, the real star was really on Ryan’s wrist- A Patek Philippe. As with most heist movies, time plays a big role (the Driver’s 5 minute rule) and there’s no better timepiece to keep track of passing seconds than a Patek Philippe chronometer. 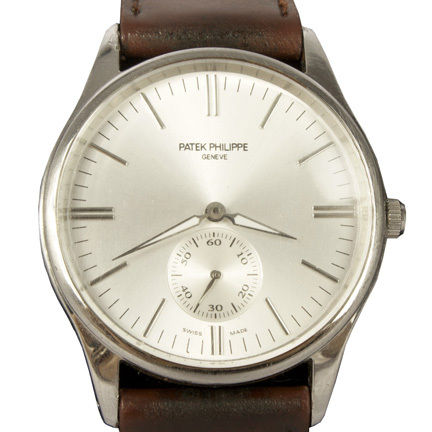 Custom made specially for Drive, this Patek Philippe with white luminous hour, minute hands and small seconds was given a brown leather band and featured prominently in integral moments of the film (it was strapped to the steering wheel whenever he was waiting). Yes it was on sale here, sadly sold now. Indeed, I will always remember his Patek Philippe.